Approximately two-thirds of children get at least one middle-ear infection (otitis media) by age 3, and one-third of these children will experience at least three episodes. The earlier a child gets their first ear infection, the more susceptible they are to recurrent episodes. Children with recurrent ear infections accompanied by middle-ear fluid (otitis media with effusion) often experience fluctuating mild to moderate hearing loss. This type of hearing loss can be difficult to detect, yet can have a major effect on language and speech-sound acquisition. Speech-language pathologists can play an important role in tracking the occurrence and effects of middle-ear infections. When I began working closely with an audiologist, I more fully understood the effects of recurrent middle-ear infections. The resulting fluctuating hearing loss can cause a child to miss up to half of the speech signal, contribute to attention problems and distractibility, and may ultimately lead to language, reading and academic delays. This is important to know when working with early intervention clients and when trying to drive intervention. One of our clinic’s favorite resources is a series of handouts, “Relationship of Hearing Loss to Listening and Learning Needs.” Written with school-aged children in mind, the handouts describe the functional implications of hearing loss: the possible effects on understanding language and speech, developing social skills, and the need for academic accommodations and services. We often use these handouts to help parents understand the level of hearing loss their child is experiencing, and how this loss affects their communication. Armed with this knowledge, I now always follow—and advocate for other SLPs to follow—ASHA best practices by referring for a hearing test after any initial speech and language evaluation. I now know to set up regular check-ins with my business partner—audiologist Melissa Wilson—so she can examine the child’s ear or complete a quick tympanogram (measurement of the movement of the ear drum) before or after one of my sessions. This gives her the health status of the client’s middle ear. I also collaborate with a pediatrician’s office that uses Oto by CellScope with families—an otoscope that attaches to an iPhone, allowing parents to send in videos of their child’s eardrums to medical providers for more efficient diagnosis of ear infections. Below, I listed some tips I learned about detecting possible ear infections. It’s not always just fevers and tears! Working with a child weekly allows SLPs to gain a good picture when something might be off, so keep an eye out for these behaviors and signs during sessions. If you become suspicious of an ear infection or hearing loss from repeated infections, you can give parents an audiology referral. Ear tugging: I find this to be one of the most common sign of a “silent” ear infection. Many times, I notice children swat, pull or tug at their ears. Children will also place toys up by their ear. Typically, if you ask the parents, they’ve noticed frequent ear tugging over the past week or two, which often signifies irritation within the ear. Sleepless nights: If parents report their child’s sleep schedule is off, and/or you notice an increase in crying, this could also signal an ear infection. Bedtime blues: If you or the parents note the child gets upset when they lie down, this might mean they feel pressure or fluid build-up within the middle ear and Eustachian tube. Tummy troubles: Vomiting, diarrhea or diminished appetite may point toward ear infection. “Huh? 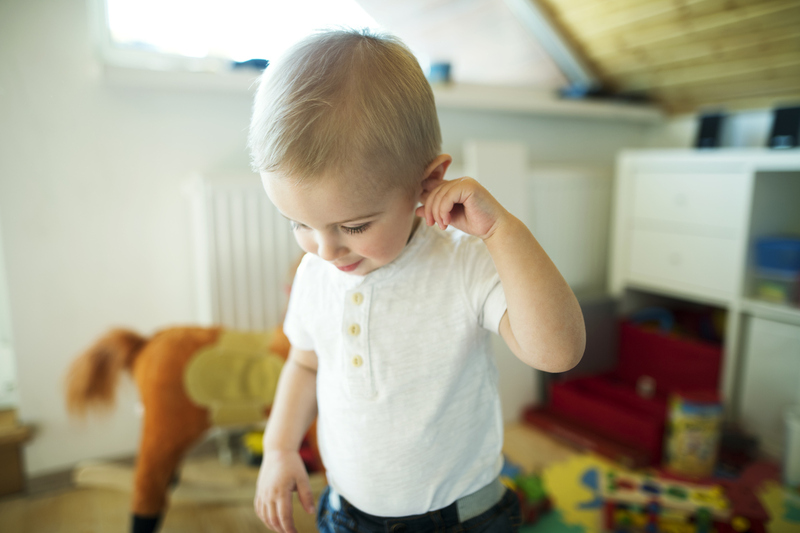 What?”: If you or parents notice the client repeatedly asking “huh?” or “what?”, ignoring you, or not responding to sounds they typically attend to, the child could have hearing loss. Drainage: If you see fluid or pus exiting the ear canal, the child might have a perforated eardrum. In this case, the pressure build-up was so great that it burst through the eardrum. Decreased clarity: For children with recurring ear infections, you often notice more “mumbled” speech during an ear infection episode. Their speech intelligibility often decreases during episodes. If you don’t work alongside an audiologist to get quick checks for clients, consider building a relationship with a local audiologist, pediatrician or otolaryngologist. Then you know where to send referrals if you notice an increase in the above behaviors. By ensuring your client hears properly, you help make sure they can learn and listen at their optimum capacity. Jody Vaynshtok, MS, CCC-SLP, co-founded Sound Speech & Hearing Clinic, a private practice in San Francisco offering speech, language, hearing and auditory processing services. jody@soundshc.com. What a phenomenal resource! Thank you Jody!